Refers to a cabin of a transport vehicle having an adjustable living space sized to accommodate an automobile when the cabin is in the transport configuration, and at least one bed that is movable coupled to a side wall to transition between a stowed configuration and a deployed configuration and furniture that is movable coupled to the floor movable to a front portion of the cabin. Further comprising a ramp pivoted and coupled to the rear of the cabin and wherein the ramp is configured to be fixed in a horizontal configuration to form an outdoor deck. A pair of winches that are independently tensioned to facilitate the alignment of the automobile with the ramp structure and an adjustable suspension system configured to lower the rear portion of the cabin to expel the automobile out by gravity. The patent and design provide for a low cost version of the A class motorhomes with onboard car that are currently on the market. It uses the C class chassis as it is not necessary for the drive cabin seats to rotate for use in the main cabin. This together with the patented elements of the interior, simplifies the design and reduces the weight and length of the vehicle, with a subsequent reduced cost. Using the patent elements and some innovative design we have produced two designs. Extra Long Premium cab chassis. GVM 16,733 lb. [7,590 kg.] Length 421 ins. [10.7 m]. Isuzu Premium cab chassis was used as it provides engine access without tilting the cab. The weight of fuel, water and power generation etc. were calculated based on seven days in a “free” camp site. The dimension and weight of equipment were based on these calculations. With the car removed and the beds partially folding outside the cabin there is a large open floor area to accommodate the movable furniture that can be set up in various configurations. Rear Bi-fold doors fully open the rear of the cabin allow for an indoor/outdoor arrangement. Wheel guides both on the ramp and in the cabin ensure that the car does nor contact any part of the cabin interior, The wheel guides in the cabin fold out of the way when not in use. then hinged up at the rear to fully enclose the deck. Copies of working drawing, patent documents and photos are available to genuine buyers. This listing is for a straight sale. 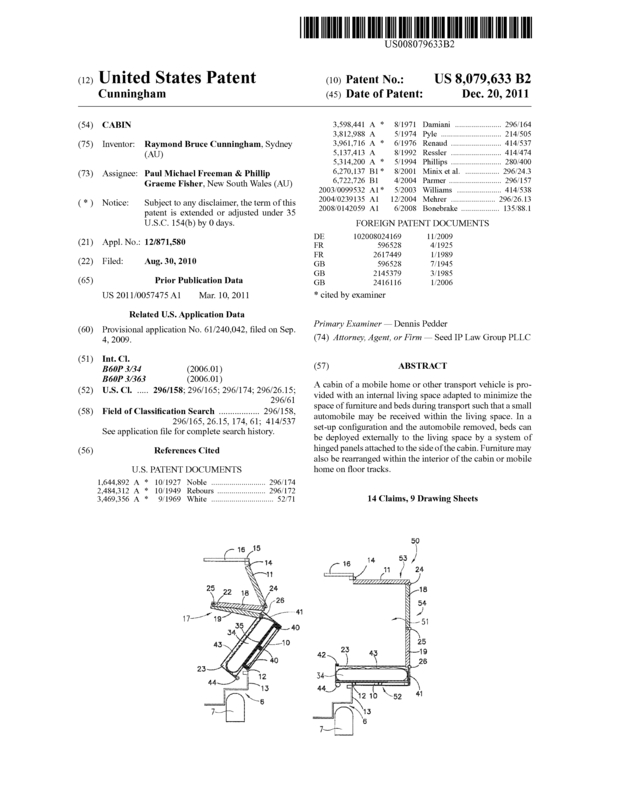 Page created at 2019-04-25 17:59:43, Patent Auction Time.